Things little explored by Android users about their phone. Smartphone have become as integral part of our body as liver kidney or heart (if not more). However many of us are not aware about very basic information of our phone. Since Android OS is currently undisputed market leader in Smartphone category this article will focus on Android phones only!! Phone basic information is stored under "About Phone" section. Different phones and Android versions have different path to this. In Moto G5 on Android 8.1 path is Setting --> System --> Android Phone. In many phones this tab is directly under Setting --> About Phone. About phone contains many Useful information regarding phone. Most of it are technical in nature and hence little explode by general users. You can get more information from this link. 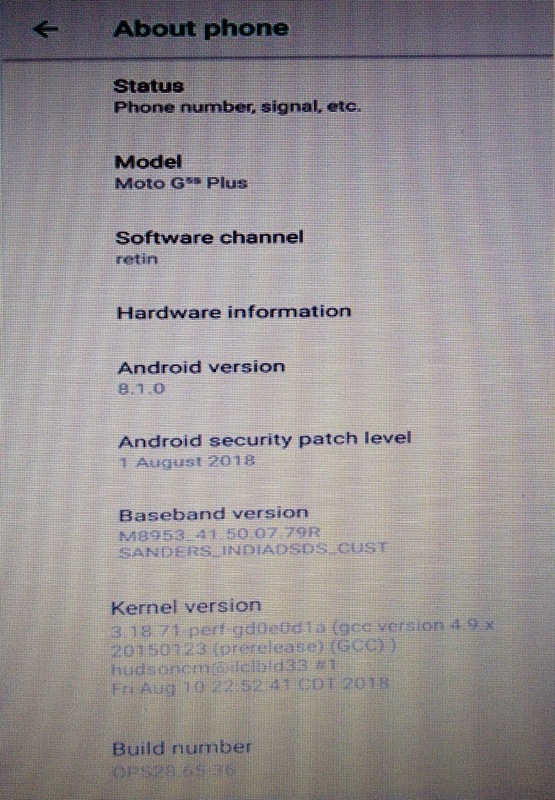 First commercial version of Android mobile operating system was released on 23-Sep-2013. There was no codename attached to it. 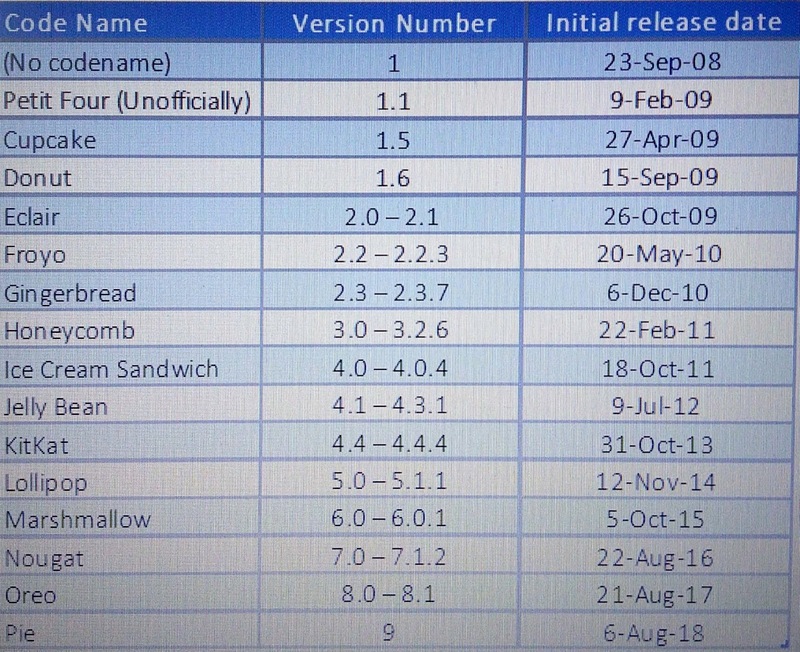 Second release was unofficially named Petit Four. Then onward every release was given an official code name based on a desert name. A giant mock-up of desert is put on display in Google campus to celebrate release of every new version. 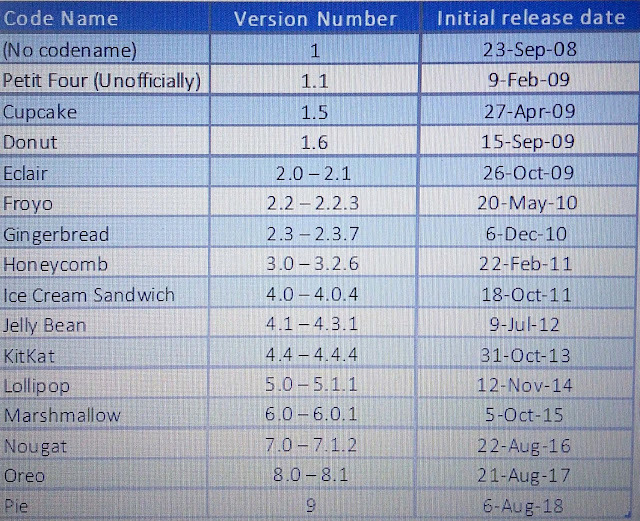 Under every android version, there are multiple update that is done. Every software update is called build. A build version helps in keeping track of current software update on phone and its history. Every operating system has a kernel. Its key job is to connect system hardware with application software. It makes application designing easier. In absence of kernel, both music player and video chat application will have to write an inbuilt program to control volume. Same is the case for every other action. If we consider all phone hardware and possible set of events (actions), the application programming will become highly complex and unmanageable without kernel. Every Android phones has two processors. a) Communication Processor: All radio communication have to follow high-level of certified standards and regulatory guidelines. 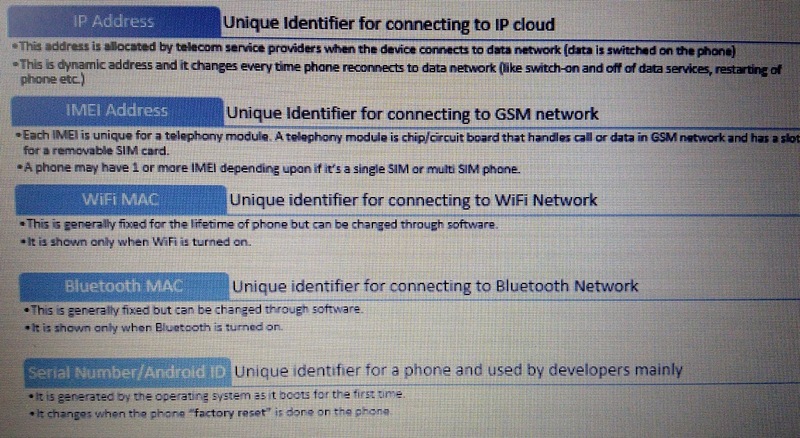 These includes voice and data call, Near Field Communication(NFC), Wi-Fi Communication, Bluetooth Communication etc. All these are thus controlled by a separate processor named CP(Communication Processor). Baseband is the software running on this processor. b) Application Processor: Controls all other activities except communication. 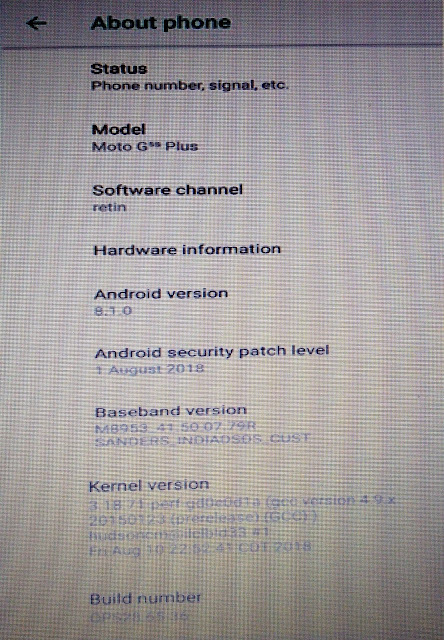 Android and Kernel version relates to software running on this processor. 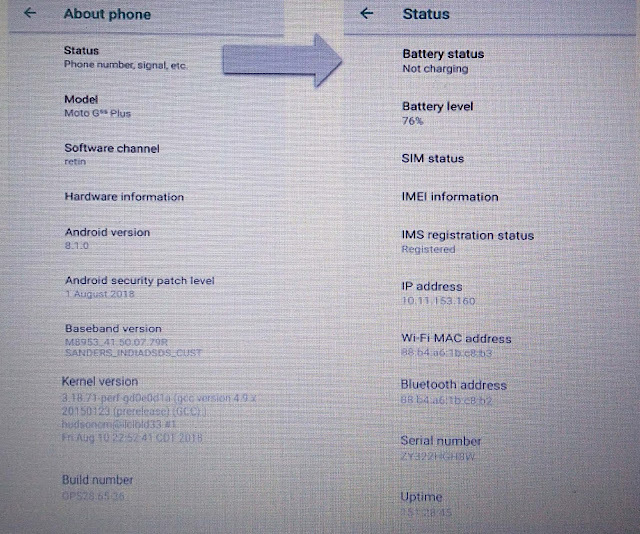 Status is first tab under about phone. Some of the information like Battery Status, Battery Level, Uptime (total time elapsed since last restart) etc are self explanatory. Other than this it contains some status and unique identifier for phone. 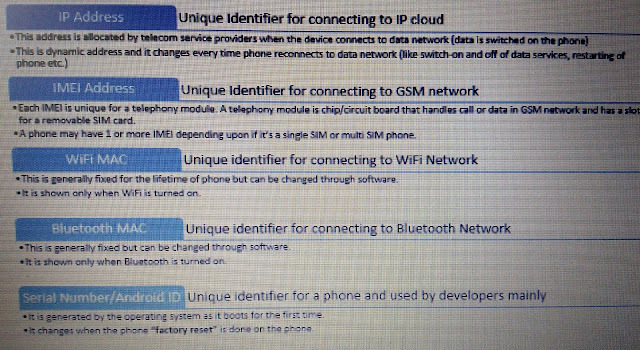 Any Android phone has at least 5 unique identifier. 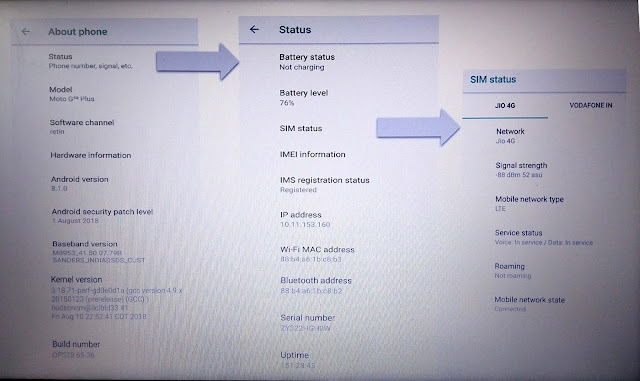 SIM status has very basic information like network operator name, type of network, phone is on roaming or not, handset is connected to network or not. Any smartphone user is well versed with these parameters. However signal strength is one parameter which needs little explanation!! Signal strength is nothing but total power transmitted through waves. It varies widely between 100kW (1 kilowatt =10^3 watt) to 56 yW (1 yocowatt = 10^(-24)) for different type of transmission. Visit this link for more details. Thus for ease of representation it is expressed in two different scale. dBm is a logarithmic scale with base 10. It can simply be converted into watt by below formula. That summarizes everything that you need to know about your phone. Next time your friend shows his/her new phone check this parameter and impress them with your knowledge. COAI in its annual report, publishes 2 different ARPU (Average Revenue Per User). First ARPU is based on TRAI methodology while second ARPU is reported by different telecom operators in their annual/quarterly report. The difference between them is exceptionally high. This not only confuses people, but they constantly make errors while reporting ARPU. Lets explore the reason for such huge gap. Overall telecom industry revenue is clubbed under 4 heads. 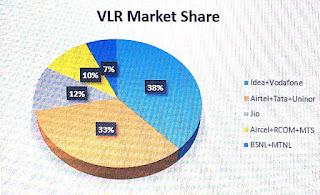 Revenue from a) Access Services b) NLD (National Long Distance) c) ILD (International Long Distance) and d) Others (VAST, ISP etc). A telecom operator includes revenue from all of these heads while calculating ARPU. However TRAI only considers revenue from Access services while calculating its ARPU. Moreover TRAI only takes AGR (Adjusted Gross Revenue) into account for ARPU. 2017 was a year of turmoil for telecom industry. Much anticipated launch of Reliance Jio hastened long awaited consolidation in industry. Price disruption was expected from a new entrant with a very deep pocket. However massive price cut was unexpected and scary. It led to massive consolidation among player and many exits. By year end only 3 major private players are left. Last year all experts predicted hard days for industry but the scale took most of them by surprise. Experts predict consolidation to complete in year 2018 and stability thereafter. However most of them are going to be WRONG again!! Upselling of products to enhance ARPU (Average Revenue Per User) of customers who were in HVC but have dropped outCross selling of products to improve stickinessRetention offer to probable drop-outs and the list goes on. However across operators same mistake is repeated i.e. looking at HVC base in silos. HVC customer do not look for discounting. Value seeking is not their nature even if they go for some impulse buying. They expect high quality service. Speedy resolution of issues faced. Clear and non intrusive communication from operators. ECG (Engagement, Communication and Grievances) model addresses all above concerns and delivers what a HVC retention needs - A Holistic Approach.